"The sword binds wielder to victim. It binds life to death." The Sword Logic is the guiding religious principle of the Hive. Most of our information comes from the Hive religious text known as the Books of Sorrow and scattered pieces of arcana from Toland's journal. The Sword Logic is both a philosophy and a metaphysical framework by which one may gain paracausal powers. It is the antithesis to the philosophy of the Light, which is associated with cooperation and sacrifice for the sake of others. The central tenet of the Sword Logic is that "existence is the struggle to exist," and that any entity - whether a life-form or a fundamental aspect of nature - which cannot protect itself against defeat should rightfully be destroyed by a more powerful entity. In the context of intelligent beings, the Logic promotes as its ultimate goal the establishment of a systematic, self-proving civilizational structure which can survive until the end of time (and possibly beyond), an end-state often referred to as the "Last True Shape". It may be likened to the ideology of Social Darwinism, in which the survival of the fittest is paramount in all aspects of life. It is a mistake to categorize it as a morality system; the Sword Logic is amoral and self-serving, a meritorious system which dictates the rise and fall of its user by the right of force. In following the principles of the Sword Logic, a being not only demonstrates its ability to survive in the face of existential challenges, but also acquires paracausal power; this is known as "becoming sharp." The ultimate expression of this power is the ability to access the Ascendant Realm, which allows one to create a Throne World and thus survive death in the "real" universe. A being who has become "sharper" still, and who has gained favor with the Darkness as a result, may also acquire the power to Take. To gain this power, it is not enough to merely defeat enemies, but to utterly annihilate them, and take their power for oneself. All such power must be taken by force, not received as a gift, else it be rendered weak and untrue. The Sword Logic is what has built the entire Hive civilization and its hierarchy. Each lesser Hive must prove itself to become greater, or risk annihilation. This holds true for every Hive, from the tiny Thrall to the Ascendant Hive god-kings, including Oryx and his sisters. Even the Worm Gods are not exempt, as evidenced by Oryx slaying Akka to gain an audience with the Darkness itself. As a byproduct of the pact made with the Worm Gods, when a Hive grows stronger from the killing of lesser life-forms and those which follow the dictates of the Light and the Darkness, so does its internal worm's lust for killing, meaning that unless it is fed enough the worm will eventually consume its host. The Leviathan knew of the Sword Logic and claimed that it led to ruin for all who followed its path; in contrast the Darkness (and Toland) claimed that it was a beautiful thing, majestic and noble, and that all life should abide by this self-proving law for this was the natural way of the universe. However there are implications that it destroys the soul and integrity of the practitioner, rendering them into an entirely different creature that would horrify themselves if they could view it objectively. For example, after untold millennia of practicing the sword logic, the emotions of love and hate gradually became indistinguishable to the Hive, and the same may have happened to joy and sorrow. Indeed, even Savathûn, who convinced Oryx originally to find the Worms, expresses doubt as to the validity of their crusade. "You are no longer bound by causal closure. Your will defeats law. Kill a hundred of your children with a long blade, Auryx, and observe the change in the blade. Observe how the universe shrinks from you in terror." The sword logic is how individual Hive grow in power. In essence, by killing their enemies, the Hive prove that they were stronger than that enemy, and through the sword logic gain that strength in reality. When Oryx killed Xivu Arath in his throne world, he proved he was mightier than her; when Oryx killed Savathûn there, he proved he was more cunning than her. Having proved that he was stronger than both, Oryx had demonstrated logically that he was strong enough to take on the Worm God Akka, and by killing Akka, Oryx proved he was strong enough to commune with the Darkness directly, as the Worms did. Repeated application of the sword logic causes the wielder to gradually become "self-defining" and "sharp": both no longer bound by physical laws and capable of outright violating them at will. It is existence asserted by violence. Both the Hive and the Worm Gods, for example, achieve faster-than-light travel by using their sharpness to cut wounds in space, which they pass through. Due to physics being inapplicable to self-defined paracausal entities which make up their own rules of existence, they are impossible for the Vex's otherwise-perfect simulations to model. Knight/Wizard Gain "tribute" through devastation. Take enough to feed their internal worm. Take enough to grow themselves. Take the tithe from the followers they command. Take as much as they dared for themselves personally without getting killed. Tithe the rest. Ascendant Hive Gain "tribute" through devastation. Take enough to feed their internal worm. Take enough to grow themselves. Take the tithe from their legions. Take as much as they dared without incurring the wrath of the God-King. Tithe the rest. Using the table above we might be able to construct the tribute system the Hive use, with allowances made for those excluded. Those who have grown enough from their cunning or strength without being killed will ascend to the next artificial stage of the Hive evolution. If they do not feed their worm the Hive organism will be devoured from within by its own worm for lack of tribute. The Worm Gods receive their tithe directly from the Hive triumvirate. The only thing unaffected by the system are the Taken, as they are bound to the will of their master until he falls. However, the worms of Taken Hive do still need to be fed. Should their master fall, the Taken are left directionless. The practice of necromancy is seen as "heresy" to the Hive who follow the Sword Logic, as reviving the slain directly contradicts the central principle of the Logic (i.e. one becomes stronger by killing other, weaker beings). Furthermore, accepting power bestowed by more powerful beings is also a violation of the Logic; to obtain power, one must take it by force. The disgraced Hive Prince Nokris broke both tenets of the Sword Logic by consummating a pact with the Worm God Xol (the weakest of his brethren), who bequeathed knowledge of the forbidden art of necromancy to Nokris. When his actions were discovered by his father Oryx, Nokris was branded a heretic, exiled and condemned to obscurity as his father removed nearly all traces of his existence. It should be noted, however, that not all forms of resurrection are heretical: when Ascendant Hive are killed in the "normal" universe, they are banished to their Throne World and can return after a time. A Hive being may also "hide their death" within a construct known as an Oversoul, which will house their consciousness should their body be destroyed. Additionally, Oryx is recorded in the Books of Sorrow as having resurrected both of his sisters during the early history of the Hive, after both had undergone deaths within his Throne World. Furthermore, a Hive ritual on Titan was observed in which a Knight was repeatedly killed and apparently resurrected. In light of the events surrounding Nokris' banishment, it may be the case that only non-Ascendant Hive are forbidden from engaging in resurrection. Alternatively, perhaps it is the case that resurrecting oneself via the use of a Throne World is permitted, but it is specifically the resurrection of beings other than oneself that is forbidden, as doing so may be seen as a form of altruism and therefore contradictory to Sword Logic principles. "The capture of Hive leadership might yield vital strategic intelligence, including weapons or tactics capable of defeating Guardians permanently." The Vex first learned of the Sword Logic when Crota accidentally cut open a portal into one of their sealed dimensions. At first they were confused, their models and projections clashing horribly with the physics of Oryx's throneworld, until they manifested Quria, Blade Transform who quickly deduced the source of the Hive's power and organized a series of test invasions in a plan to bootstrap itself to godhood according to the Hive's own rules. Oryx eventually returned home and defeated the Vex, closing off Crota's portal after throwing his son through it, but not before acknowledging the Vex as a worthy foe. The Vex may have been exposed to the Sword Logic earlier than Crota's mishap, for Savathûn had known of them and had been the one behind Crota's "accident," but they only began studying it in earnest after Quria uploaded its data on Oryx's Ascendant Realm to the greater Vex network, following its second failed invasion. Cabal Emperor Calus knew of the story of Oryx and his species through a device called the OXA Machine, and of their fall to the Worm gods. General Umun'arath (who curiously shares part of her name with Xivu Arath) was well acquainted with the horrors of fighting Hive. Whether or not the Cabal as a species studied the Sword Logic remains to be seen. The Martian Cabal Legions have little to no experience with the Sword Logic, having never engaged with the Hive in protracted combat except once on the Moon and knowing that the Hive had weapons or tactics which effectively neutralized Guardian resurrection. Once the Skyburners Legion set foot upon the Dreadnaught they became beholden to the Sword Logic but showed no indication that they recognized any differences to conventional physics. Nonetheless with the defeat of Oryx, the Cabal contingent aboard the Dreadnaught have continued to hold out despite overwhelming losses. The Fallen have not been observed to adapt the Sword Logic to their tactics until the SIVA Crisis, when the Devil Splicers began experimenting with SIVA and transcended flesh entirely. Though not wholly like the Hive and the Worm Gods, the Fallen's behavior is similar enough to the precepts of the Final Shape that they have comprehended a form of the Sword Logic. SIVA itself echoes the Sword Logic on a nanoscale, learning from what it adapts to itself. 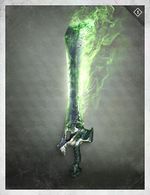 In order to defeat Oryx for good (and by extension Crota, though unwittingly), the Guardians tapped into the power of the Sword Logic, as even Light was forced to obeyed it within the bounds of his Ascendant Realm. However, in defiance of the Sword Logic's edicts, the Guardians did not carry through and claim their enemy's power. This infuriated Toland as he saw the raid team which killed Oryx and his Court leave without taking his place, leaving his power open to be seized by another, and meaning all that he had worked for was for nothing. The Baron of the Scorn known as Hiraks, the Mindbender has dedicated himself to understanding and harnessing the Sword Logic and other Hive secrets. He has apparently been successful in carving out his own Throne World in the Ascendant Realm, and has the ability to sway lesser Hive creatures to follow his whims. "I am Oryx, the Taken King. And I have the power to take life and make it my own." — Oryx declaring his power after his first audience with the Darkness. The Taken are corrupted members of various species the Hive have encountered and destroyed. First demonstrated against the Ecumene after Oryx communed with the Darkness, the Taken as a whole are described as a "paracausal ontopathogenic weapon" which infects the physical existence of an enemy and binds them to the will of Oryx. They serve as Oryx's proxies, as during the war against the Ecumene they allowed him to kill en mass far more than ordinary Hive could do, as he could Take the enemy's soldiers to replace his own losses and empower his forces with their abilities. Being Taken transforms the victim into a more perfect form, the desired end-state of obeying the Sword Logic. As Taken are not known to obey the conventional Hive hierarchy and tribute system, it may be that their new forms have rendered those systems unnecessary. ↑ Ogres are an anomaly in the Tribute system. They are Thrall mutated into killing machines but instead kill for different reasons other than to feed their worm. The Sword Logic is very similar to the "might makes right" aphorism with several meanings. One is that a ruling elite determines what society views as right and wrong. Another is that whomever "labels what they think is good for [themselves] as right, only those who are able to defeat their enemies can push their idea of what is right into fruition". According to William Montague, Kraterocracy (Gr. κρατερός, or krateros, meaning "strong") is a form of government ruled by those strong enough to have seized the reins of power through might or cunning. This is similar to how the Worms introduce Sword Logic to Auryx. ↑ Cabal Booklet, "Ghaul, The Dominus", ("Let me tell you a story from the OXA Machine. Once upon a time, a small people lived on a dangerous world. By nature they were petty and fearful. But they strove to be better, and together they overcame their fear. Unto these people came a king, who said, "We are surrounded by enemies, we are weak and frail. But I have an answer. Eat these larvae, my people, and with their strength we will rise up." Whenever anyone protested the king, the king said, "Are you working with our enemies? No? Then why are you afraid of our strength?"